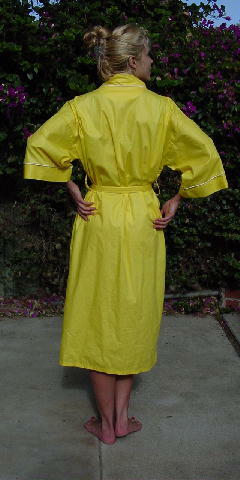 This sunshine yellow polished cotton robe has a white cord accent trim. There are two front pockets and the left one has a white Cardin symbol on it. The tag says Pierre Cardin Paris New York. There are side double belt loops for that comfortable waist fit. Wearing this bright cheerful robe is the perfect way to start off your day. belt 72" by 1 7/8"